The first time I made this recipe from The China Study All-Stars Collection cookbook I wasn’t really expecting much from it. With only three components, and a minimal amount of cinnamon, how could this possibly taste good? Also, the texture seems weird…I mean, sweet potato, apple, and banana? 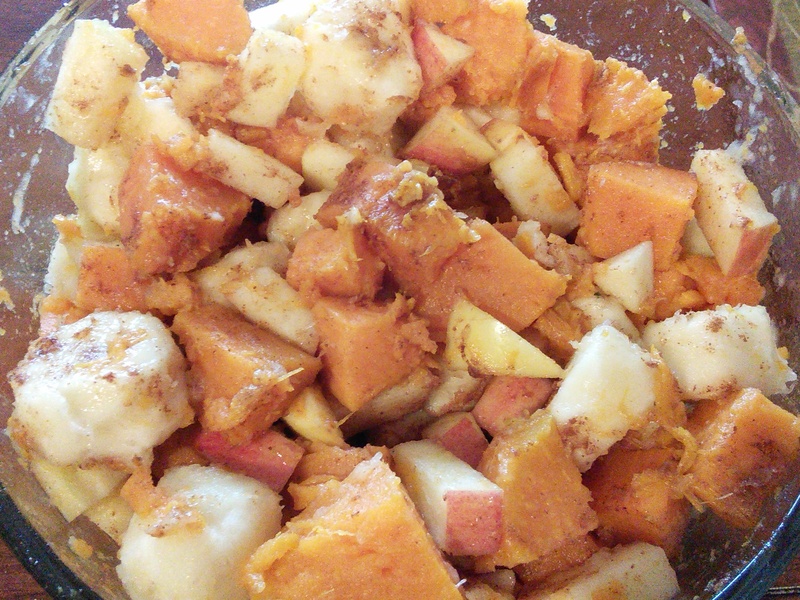 The first time I made it I decided to scrap the recipe directions and cooked the sweet potatoes and apples in a crock pot for a few hours. It turned out really well! So I thought, hey, why not try making this a few different ways and see how it turns out? After experimenting with it, I think the original recipe might actually be the best way to do it. 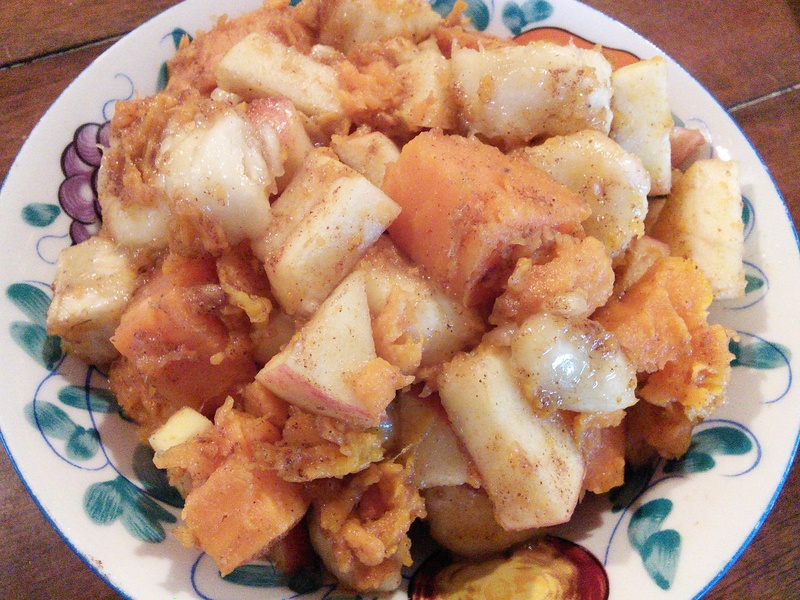 The crock pot version gives everything more of the apple flavoring, and the apples are nice and mushy, but the sweet potatoes are too mushy for my tastes. I’ve also tried just microwaving the sweet potatoes. It isn’t bad, but it’s not as good as actually baking them (like the recipe calls for). You can microwave them to save time and have this as a quick breakfast—waiting on them to bake in the oven may be impractical for a get-up-and-go type of morning. ½ tsp. cinnamon, or more if you like cinnamon! The longest part of this is baking the sweet potatoes. I put mine in the oven at 400° for about 35 minutes. Make sure to stab them with a fork a few times before putting them in! Give them a few minutes to cool off after taking them out of the oven. The skin should peel off easily with your fingers (be careful not to burn yourself!). 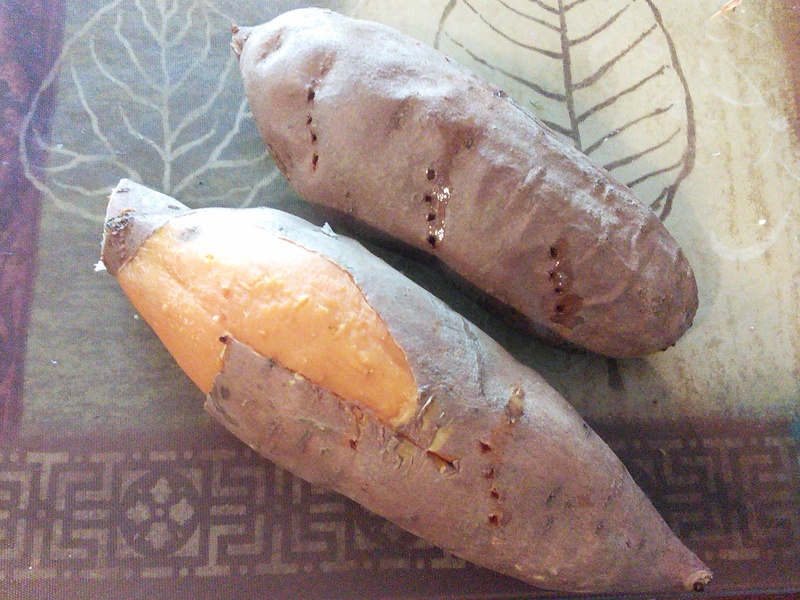 Chop up the sweet potatoes after peeling them. I cut mine into medallions then quartered the medallions. Chop them however you want, so long as they are small enough to fit on a spoon with banana & apple pieces. 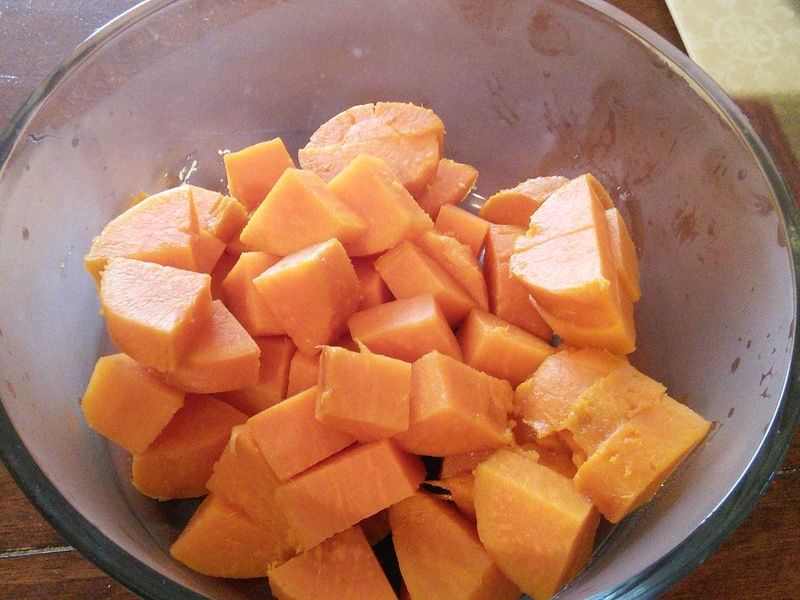 Put the sweet potato chunks in a large microwave-safe bowl. Add the sliced banana, apple, and cinnamon. Stir it all up. Heat the entire mix up in the microwave for about a minute and a half. Done!